Game 3 will start in 10 minutes. For the Rangers, it’s do or die. Not literally. But if they don’t win on home ice at MSG tonight, then they may as well book tee times for the rest of the month. Here they are trailing the Senators 2-0 with both losses in excruciating fashion. Game 1 on Erik Karlsson’s sharp angle goal that stunned Henrik Lundqvist. Game 2 on Jean-Gabriel Druce Pageau scoring twice in the final 3:19 and then bombing one past Lundqvist in double overtime for a four goal night in an improbable Ottawa 6-5 win in sudden death. One in which Nick Holden got caught pinching on the winner leaving Marc Staal to defend a two-on-one. He gave Pageau the shot and he hit the top corner with a bullet. So, now the Blueshirts must dig deep at MSG. Win tonight and they’re back in it. So, what is Alain Vigneault’s response? Naturally, to bench Pavel Buchnevich for Tanner Glass. Nothing against Glass, who’ll work hard on a fourth line with Oscar Lindberg and whipping boy J.T. Miller. But how can Vigneault justify rolling four lines? It’s gonna be hard against Ottawa, who can play four and have proven fully capable unlike Montreal. Miller looked better in the last game and what’s his reward. On a mismatched fourth line that probably will get on the score sheet. Isn’t that how it always works? Miller should be on one of the top two lines. Enough of this crap. Sure. His postseason has been miserable. 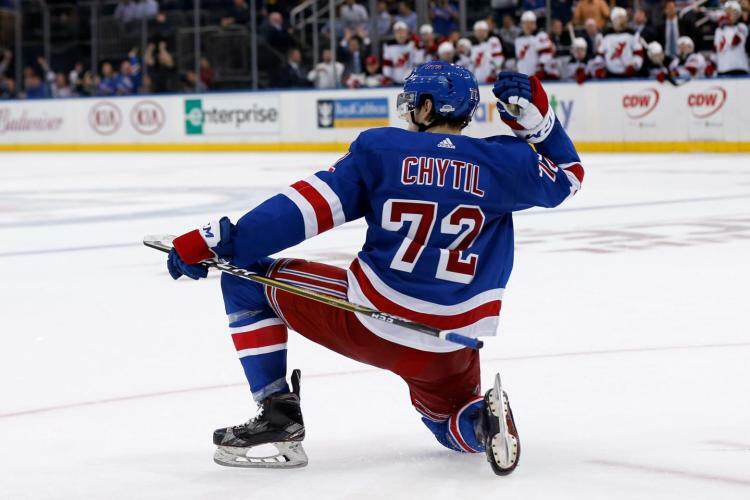 But he was one of the most dangerous Rangers in the third period and the overtimes after Vigneault cut down to 10 forwards and moved him up. With AV, he is stubborn to a fault. Loyal to the mismatched Staal/Holden pair that has been a nightmare. Unwilling to play Brady Skjei and Brendan Smith enough. If he doesn’t tonight, it’s his funeral. For the 18 skaters including Lundqvist, who better deliver after an awful Game 2, they know what’s at stake. I’m guaranteeing a Rangers victory. I believe in this experienced group and their character. Now, it’s time for them to show it! This entry was posted in NHL Playoffs, NYRangers and tagged Alain Vigneault, Game 3, Henrik Lundqvist, J.T. Miller, Oscar Lindberg, Pavel Buchnevich, Rangers, Senators, Tanner Glass. Bookmark the permalink.